Need a durable way to present a professional image to clients and prospects? Looking to hand out branded reports, catalogs or booklets at your next company presentation? If so, one of the binding options discussed below could be the right product packaging solution for you. Binding is more than just a fastener that holds a catalog together. 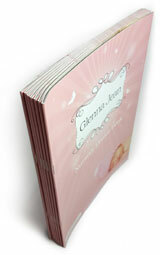 The right binding can create an image, improve durability, or make a catalog easier to read. At PFL, we offer several catalog binding options. is the most common catalog binding method. Folded catalog pages, or "signatures" are placed, or "saddled" on equipment and then stapled together along the center fold. More on saddle stitching. Saddle stitching is appropriate for catalogs that are 4 to 64 pages. Saddle stitched catalogs or booklets should be designed to account for "creep." As catalog pages are stacked and folded, the outer pages protrude farther than the inner ones. Be sure your design allows room to trim the catalog edges so they're flush and uniform. is the same binding used for magazines and paperback books. With perfect binding, pages are securely attached to one another with a strong adhesive, creating a professional-looking, squared-off spine. 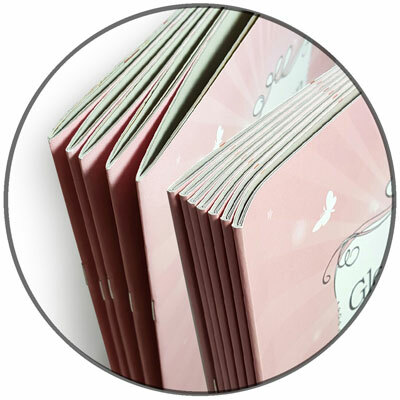 Perfect binding, also known as edge binding, is best suited to catalogs that are more than 40 pages long. More on perfect binding. offers an affordable compromise between the economical and secure saddle stitch and the professional-looking perfect binding. With square back binding, the pages are secured with two staples along the center fold. Then we apply pressure to the spine to create a squared-off look. Square back binding is suitable for digital printing projects of 28-120 pages. More on square back binding. is traditionally used on school notebooks and manuals, with strips of metal or plastic coiled through holes on one side of the paper. We offer coils in black or colored plastics to give projects a professional and custom look. Coil binding is suitable for projects from 4.25 x 4.25 inches to 12 x 14 inches. More on coil binding. lays flat when opened, and it's a durable and user-friendly way to bind booklets and manuals that will be used again and again. C-shaped wires are threaded into holes along one edge of the pages, creating an attractive binding that stands up to repeated use. More on Wire-O binding. Wire-O binding comes in a variety of colors and can secure up to 350 pages. Wire-O bound pages line up perfectly when opened. This makes them ideal for overlays, two-page maps, or any project where exact alignment is important. The number of pages. Some binding options, like saddle stitch, work only for shorter catalogs, while perfect binding can create a catalog that feels more like a book. The way the catalog will be used. Retail catalogs and or owner's manuals work well with saddle stitching, perfect binding and square back binding. Spiral and wire-o binding can be good choices for presentation documents, handbooks, calendars, journals, training manuals and cookbooks. Will it be mailed. 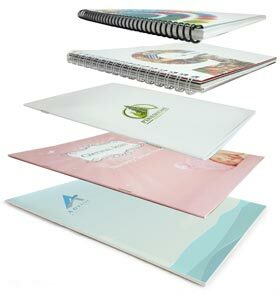 Catalogs with perfect or square back bindings are easier to handle and stack than saddle stitched catalogs, making them good choices for mailing. Catalogs can accommodate magazine-type layouts that show your products in action alongside in-depth articles about the way they're made, your company story, or the way your business is helping the environment. Perfect binding and square back binding make catalogs feel more like magazines — meant to be saved and re-read. Annual catalogs are like reference manuals that customers can consult again and again. Use perfect binding for the maximum page count, or use spiral or Wire-O binding for durability and easy reference. Binding does far more than hold a catalog's pages together. It improves usability and sets the tone for the entire catalog. PFL's wide variety of binding options ensures that you'll always find the perfect binding solution for all your catalog, manual and booklet projects. Have questions about how best to bind your catalog?